The Young Turks, one of the most popular online news shows in the world, has amassed a YouTube network of over 2.4 million subscribers and 2 billion views. But that wasn’t always the case. 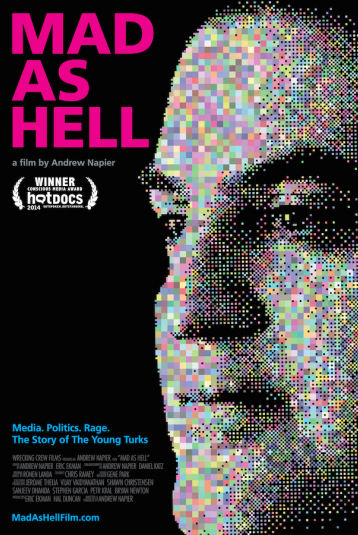 MAD AS HELL documents the tumultuous, at times hilarious and altogether astonishing trajectory of Cenk Uygur, The Young Turks’ main host and founder, as he traverses from unknown Public Access TV host to internet sensation by way of YouTube. When he ventures into national television by landing the 6 PM time slot on MSNBC, Cenk’s uncensored brand of journalism is compromised as he becomes a thorn in the side of traditional news media; his unwavering dedication to speaking the truth puts him at the very nexus of the battle between new and old media, and makes MAD AS HELL not only entertaining, but incredibly timely as well.